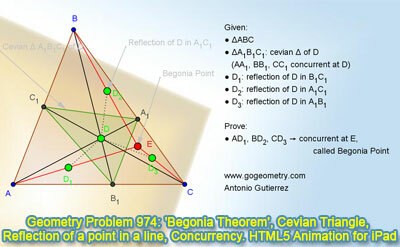 GeoGebra Dynamic Geometry Problem 974: 'Begonia Theorem', Cevian Triangle, Reflection of a point in a line, Concurrency of Lines. HTML5 Animation for Tablets (iPad, Nexus), Mathematics Education. Distance learning. The dynamic figure below shows a triangle ABC and a point D. The triangle A1B1C1 is the cevian triangle of D (cevians AA1, BB1, CC1 concurrent at D). D1, D2, and D3 are the reflections of D in the lines B1C1, A1C1, A1B1. Prove that the lines AD1, BD2, CD3 are concurrent at E, called "begonia point". Reference: Darij Grinberg, Begonia points and coaxal circles. See also: Kaleidoscope of Problem 974 base on Poincare Disk Model. The interactive demonstration above was created with GeoGebra.